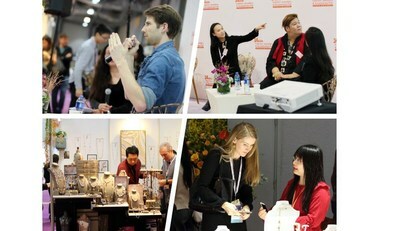 HONG KONG, March 28, 2019 /PRNewswire/ -- Held from 27 February to 2 March in Halls 3 and 6 of the AsiaWorld-Expo (AWE), Asia's Fashion Jewellery & Accessories Fair – March (3FJ) recorded a 13.3 percent increase in buyer turnout, with international visitors, excluding China-based buyers, accounting for 54.2 percent of total attendance. The fair welcomed 5,486 unique visitors from more than 100 countries and regions during its four-day run. Each attendee was only counted once for this count. Of the 5,486 show attendees, 2,971 visitors were from overseas (excluding mainland China), an increase of 8.4 percent compared with last year's numbers; 1,583 were from mainland China or 33.8 percent above the previous year's total; and 932 hailed from Hong Kong or 1.4 percent above last year's total. The countries/ regions with the top attendance figures included India (387), the US (295), Thailand (172), Taiwan (148), Australia (141), Italy (132), Japan (128) and the Philippines (121). High increases in visitor numbers were recorded from India, Thailand, the US, the Philippines, Australia, Malaysia, Macau, Poland and Singapore. "3FJ has given our attendees a head start on the trends that would likely sweep the fashion jewellery and accessories market in the coming seasons," shared Celine Lau, Director for Jewellery Fairs at UBM Asia, an Informa Plc company. "Pieces with artisanal touches and inspired by natural forms and textures are quite popular, and this could be a reflection of the consumer's growing demand for authenticity. Collections that allow for personalisation are warmly received as well. We are also seeing strong interest in men's jewellery and sleek, edgy accessories in mixed metals." Gold- and silver-plated, finished (unplated), stainless steel and gem-set jewellery products were among the most popular items at the fair. The scope of 3FJ's buyer profile consisted of wholesalers, retailers, importers, manufacturers/suppliers and exporters. 3FJ featured quality exhibitors who represented the best of the fashion jewellery and accessories world. The show's rich content, spiced up by five networking events, also served as an indicator of trends and style directions to watch out for in the coming seasons. 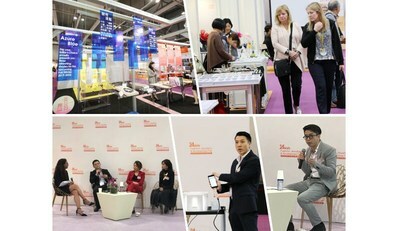 The fair's anchor pavilions highlighted the latest collections of manufacturers from India, Korea, mainland China, the Philippines and the Taiwan region. The Designer Atelier, Fashion Accessories Zone and the Stainless Steel Jewellery Pavilion (including Men's Jewellery) were also among the show's core attractions. 3FJ likewise debuted its Networking Area, an intimate space that hosted five events over a three-day period. The panellists and speakers, who brought a good mix of talent, expertise and experience to the events, shared their insights on "Fashion Jewellery and Accessories Market Trends," "Craftsmanship and Manufacturing Innovation," "Fashion Jewellery Development (Positive Changes) in the China Market" and "Art Therapy – Trends Reshaping the Fashion Jewellery and Accessories Industry". 3FJ Product Photography Partner Picup Media also gave a product demonstration on its smartphone jewellery lightbox, a "lighting environment" that allows jewellers to capture studio-quality images using their phones. For media-related inquiries and sponsorship opportunities about Asia's Fashion Jewellery & Accessories Fair – March and September editions, contact pressafj-hk@ubm.com. For exhibiting opportunities, contact salesafj-hk@ubm.com.